If you were a Major League manager, would you ever load the bases intentionally in the bottom of the ninth inning of a tie ballgame in order to face Carlos Delgado? Lou Piniella did just that, ordering pitcher Mike Wuertz to walk Carlos Beltran and load the bases with two out. How often in Delgado’s career has that occurred? It turned out to be a poor decision, as Delgado had a tremendous at-bat, working the count full, then fouling off several pitches before taking ball four, a high fastball, to score Jose Reyes from third base. What ended as a fundamentally sound game for the Mets, however, did not begin as such. Though no errors lit up on the scoreboard, the Mets played sloppy defense in the first two innings behind Tommy Glavine to give the Cubs a quick 4-0 lead. Actually, that may be too critical a judgment — perhaps it was dumb luck that four balls just barely eluded the grasp of Carlos Beltran, Damion Easley, Shawn Gree, and Endy Chavez. In the first inning, with two outs and Alfonso Soriano on second base, Aramis Ramirez lifted a fly ball to center that missed the webbing of Beltran’s glove and nearly bounced off his shoetop, allowing Soriano to score with the first run of the game. In the second, a walk to Mark DeRosa was followed by a dying quail toward leftfield off the bat of Angel Pagan. Endy Chavez made a valiant, diving effort, but the ball fell safely out of his reach. You can’t blame Endy after that kind of effort, but the ball seemed to find a way to miss his glove. It turned out to be a double, putting runners on second and third for pitcher Jason Marquis. Marquis hit a grounder toward second base that bounced three inches past Damion Easley’s glove, scoring both runners. Why Easley didn’t dive, or do something to keep the ball in the infield, is anyone’s guess. After Ryan Theriot flied out for the second out of the inning, Cesar Izturis hit a Texas Leaguer between Shawn Green and Damion Easley. Green wanted no part of the ball, and Easley couldn’t get to it, so the ball fell safely between them, scoring the Cubs’ fourth run of the game. As it turned out, that would be all they’d get on the evening. After that rocky start, Glavine pitched very well, retiring the next nine batters in a row before pitching around everyone in the fifth. After getting two quick outs, Glavine unintentionally intentionally walked the heart of the Cubs lineup — Soriano, Ramirez, and Murton — then went to a full count on Mark DeRosa before inducing an inning-ending fly ball to center. Glavine hung on for one more scoreless inning — but not before giving up Marquis’ second base hit. Because of the extended first two innings, and the wild fifth, Glavine was not very efficient with his pitches, throwing 106 over six, and Joe Smith took over in the seventh. All in all, in Glavine’s bid for his 295th victory, he did not pitch well enough to win, but pitched just well enough not to lose. Marquis, on the other hand, pitched well enough to win in the first five innings, save for a two-run homer yielded to David Wright in the fourth. However, Marquis ran out of gas in the sixth, when he gave up consecutive singles to Delgado and Wright to lead off the inning. Piniella brought in lefty Will Ohman to face Shawn Green, who struck out on six pitches. Ohman was then replaced by my favorite ice cream flavor, Rocky Cherry, who gave up a one-run double to Paul LoDuca and a sac fly to Damion Easley to tie the game. LoDuca looked to be zoning “middle in”, and ripped an inside, hanging slider down the third base line. The Mets had a chance to put the hammer down on Cherry in the seventh, but could not scoop out a run. Endy Chavez bounced a one-out infield hit and Carlos Beltran followed with a walk. 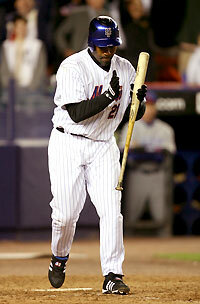 However, Carlos Delgado ended the threat with a weak double-play grounder to second base. They couldn’t gather another rally until there were two outs in the ninth, when Jose Reyes started things with a ground ball single up the middle. David Wright went 3-for-4 on the day, including the two-run homer, and scored twice. Endy Chavez went 2-for-4 with a walk, and Reyes had one hit, one walk, and two stolen bases (he now has 23 on the season). Joe Smith threw a scoreless seventh, then got one out in the eighth before Pedro Feliciano finished off the inning without incident. Feliciano got two quick outs in the top of the ninth before allowing a double to Ryan Theriot. Aaron Heilman was then brought in and induced a weak comebacker from Cesar Izturis. In the end, Heilman threw one pitch to scam his fourth win of the year.